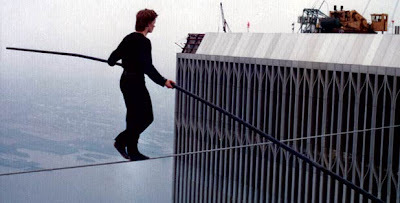 Right now I think Man on Wire (review) is a lock (but then again I'm partial), with standard bearer Errol Morris' Standard Operation Procedure, Werner Herzog's Encounters at the End of the World, and Trouble the Water (review), in serious contention. However, since the nominating committee must see all 15 films, any could be a threat, from the more high profile films like I.O.U.S.A. to the more obscure ones like The Betrayal (Nerakhoon). My only regrets are not seeing Patti Smith: Dream of Life (review) shortlisted...it's still one of my very favorite films of the year, as well as the deeply affecting Up the Yangtze (review). As always this will be an interesting race to watch. I now believe that DEAR ZACHARY is the year's best doc., edging out MAN ON WIRE and UP THE YANGTZE. But of course it is not eligible. How could I forget UP THE YANGTZE!? Thanks for pointing out my oversight. Haven't seen DEAR ZACHARY yet, but I'm definitely looking forward to it. In the holidays, after my exam, I get to see Man on Wire! Cannot wait. What about Bigger, Stronger , Faster? That's one of the years best reviewed films, and truly eye opening.